Tag line: "How much does Heaven Allow a Woman in Love?" With All That Heaven Allows, director Douglas Sirk paints a disturbing mural of small-town America, one that reveals a side of suburbia often ignored by his contemporaries. By examining, in great detail, a closed-minded society; where unwritten rules are firmly adhered to and deviations from the norm are not tolerated, Sirk successfully de-glamorizes what many, at the time, believed to be the ideal way of life. 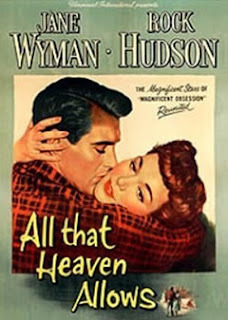 Cary Scott (Jane Wyman), a recently widowed middle-aged mother of two, falls in love with Ron Kirby (Rock Hudson), a landscaper who also happens to be much younger that she is. Cary is very happy with Ron, despite the fact that her children (Gloria Talbott and William Reynolds), along with the rest of her upper-class society, disapprove of the match. Before long, Cary’s being pressured to end the affair, and finds she must decide between remaining true to herself, or appeasing those closest to her, sacrificing her own happiness for social stability. Throughout All That Heaven Allows, Sirk pushes nonconformity over convention, the individual over the hive mentality. At first, Cary’s just another member of a community in which everyone has their role to play. Hers is the kind but lonely widow who doesn’t go out much anymore, mostly because she doesn’t have a husband to accompany her. Her neighbor, Sara (Agnes Moorehead), is the concerned friend, who's made it her personal mission to set Cary up with the right man (meaning one who travels within the same social circles they themselves do). But before Sara can settle on who “Mr. Right” is, Ron Kirby enters the picture. A free spirited man of nature, Ron introduces Cary to a much different world than the one she knows, and even brings her along to a party thrown by his good friends, Mick (Charles Drake) and Alida (Virginia Grey). Cary, who, in an earlier scene at the country club, seemed stiff and uncomfortable around her “friends”, has a wonderful time at this party, and doesn't want the evening to end. It's clear that Cary loves Ron very much, but because he’s not a member of her society’s inner circle, she's forced to deal with a number of rumors floating around about the two of them (one particularly nasty bit of gossip suggests that Cary's affair with Ron started prior to her husband's death), which are taking their toll on her children. All at once, her eyes are opened to the reality of just how cruel this ‘polite society’ of hers can be, and the town that's been her home for most of her adult life suddenly feels more like a prison, from which there seems to be no escape. On the outside, Cary's community looks picture-perfect, with large houses lining the streets and perfectly manicured lawns as far as the eye can see. But, like everything else in this closed-minded society, such appearances are merely artifice, an inferred perfection that hides a contempt for individuality. At its most basic, All That Heaven Allows is a story of the soul, a spirit that longs to break free of its invisible bonds. But no matter how difficult others make it for her, Cary’s eyes have been opened to the truth, and nothing anyone does will cause them to shut again.